Jack L Amen, 51, of Billings died Dec. 8, 2000, at Deaconess Billings Hospital due to complications of pneumonia. He was born on June 16, 1949, in Billings to Gilbert and Doris(Edwards) Amen. 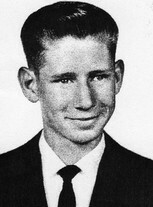 Jack graduated from Billings West High School in 1967. On Aug. 31, 1973 he married Mickey Schwend and together they had two children. Jack was a farmer at heart. He thoroughly enjoyed working on his farm and watching the crops grow. He took great satisfaction in maintaining the farm equipment and providing excellent service to the customers of his grain hauling business. Jack's family and his farm were the greatest joys of his life. Jack is survived by his wife, Mickey, two children, Molly and Bill; his mother, Doris; and grandmother, Molly Amen, all of Billings; numerous aunts, uncles, cousins, and in-laws. He was preceded in death by his Dad.